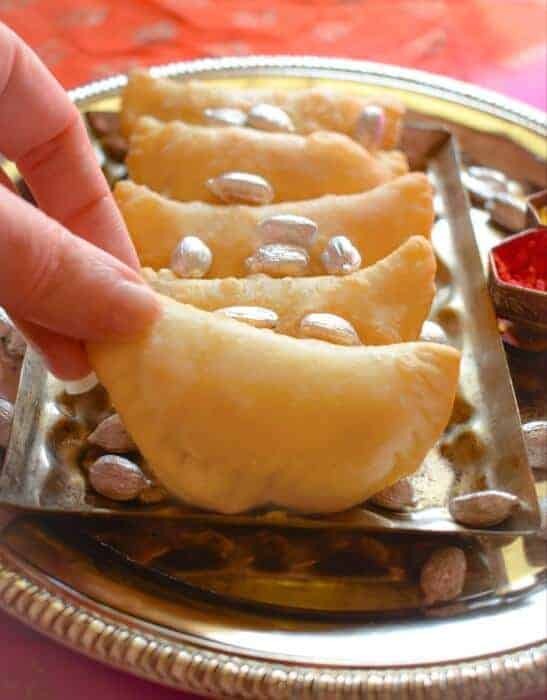 The festival of Holi is incomplete without my Best Gujiya Recipe that’s been passed on from generations to generation. What is Gujia / Karanji ? 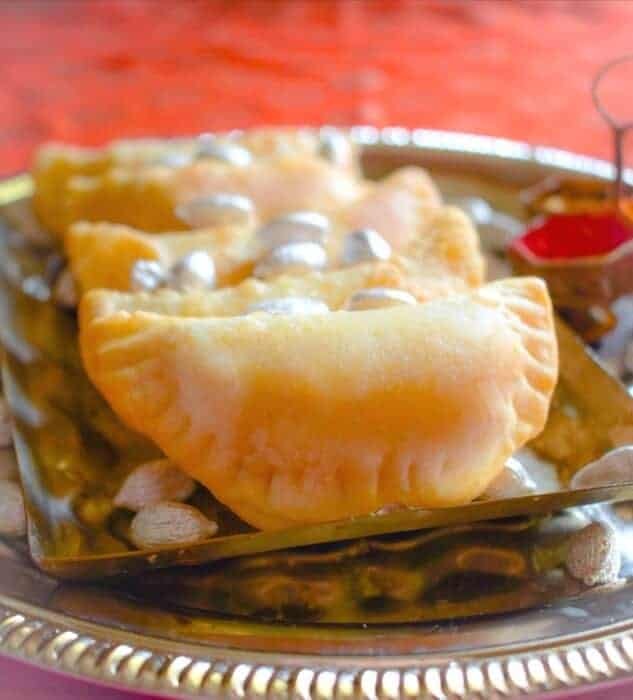 Gujia or Karanji is Indian dessert empanadas that are filled with sweet stuffing made of mawa (cottage cheese mix), coconut, dry fruit, and cardamom powder. 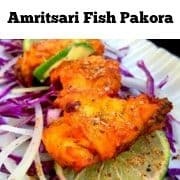 It’s then deep fried or baked. 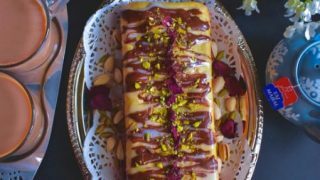 It’s one of those traditional Indian desserts recipes that made with lots of love and patience – Yes, patience is the key factor. 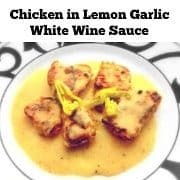 We have been making the fried version of this recipe ever since I could remember anything about cooking or making food. But as time changes and so does our health need or other circumstances hence I came up with these baked gujiya version which to my surprise my parents love and enjoy the most. I still remember when my grandmom used to visit us, we used to have tons of relatives/family friends come to our place and learn traditional Indian dish or two from her. 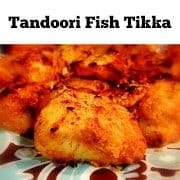 And, if it was Holi (the Festival of Color) then I would see her and mom prepare tons of these fried gujiya atleast a week before the festival….they literally made 100’s of them. 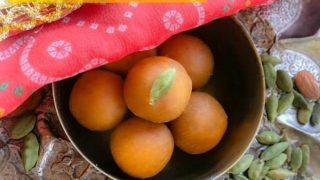 Then they were wrapped in cute little jute baskets with colorful clothing and sent over to people’s house for Holi or were given to visitors at our place. I did use to try my best to help them by either filling the stuffing or pinching the ends of the gujiya with a fork to make that cute design. 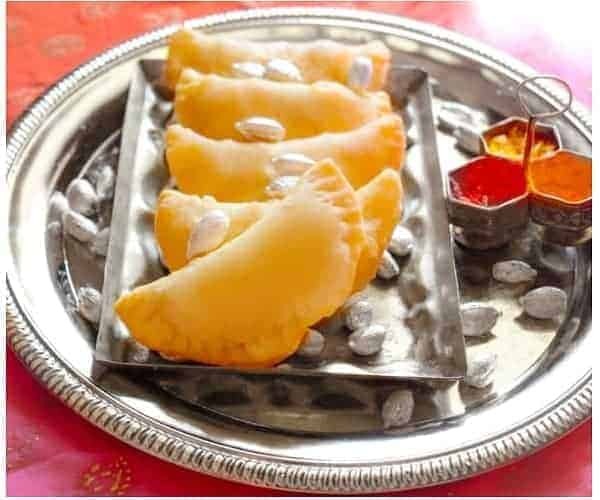 Now, as I mentioned above, this post is all about making that perfectly shaped gujiya or Indian Sweet Empanadas and I would elaborate the process step by step with pictures. Although the recipe is very simple or basic to making any pie crust dough, it still has these few nitty-gritty points. Which when missed results in sometimes undercooked/overcooked, blotchy or weird looking ones. 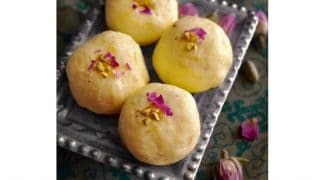 A perfectly made gujiya would be ‘ Smooth, Shiny and Almost flakey to touch’ and the filling needs to be slightly coarse in texture, properly filled, so that the gujiya doesn’t burst while frying. 1. Add enough Oil to the flour mix, so that if you try making a ball in your hand, it binds well. (pic above). 3. 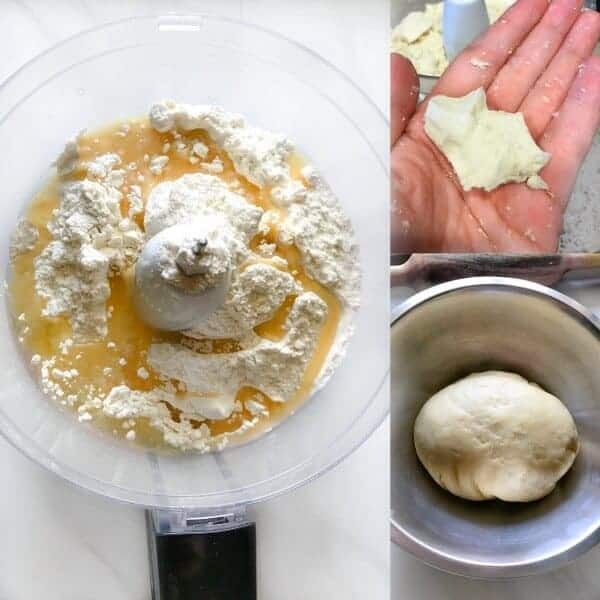 Make the dough in a food processor or dough machine as it kneads it to perfection. 4. Cover the dough with slightly moist cloth/kitchen towel to keep it from becoming too stiff. 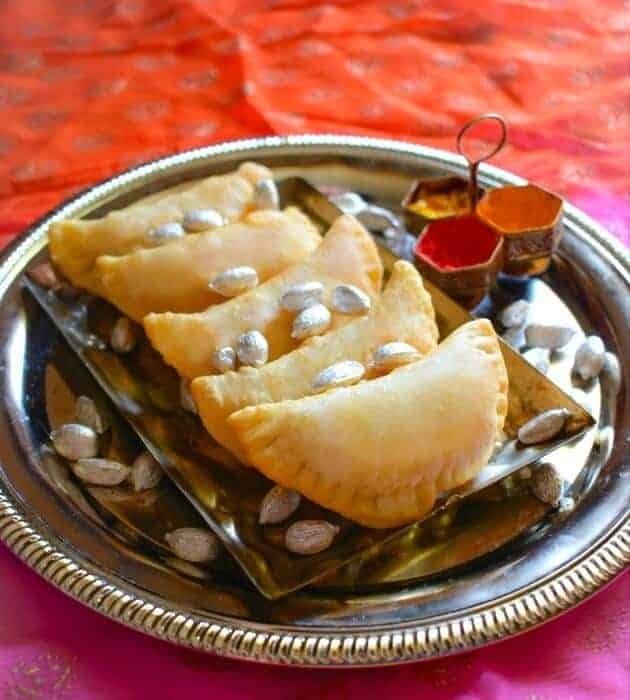 The traditional gujiya or Indian Empanadas are filled using khoya / mawa (thick milk mixture), sugar, dry fruits, green cardamom, and coconut. 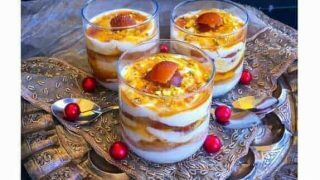 For this particular recipe, I’ve made khoya from ricotta and it is really easy to make it in a microwave in 8 minutes. 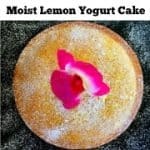 (Steps in Recipe below). 1. 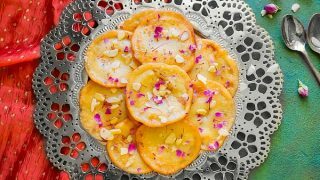 You can either use a slightly sauteed khoya for the filling. 2. You can roast the khoya with some ghee to brown it slightly more. 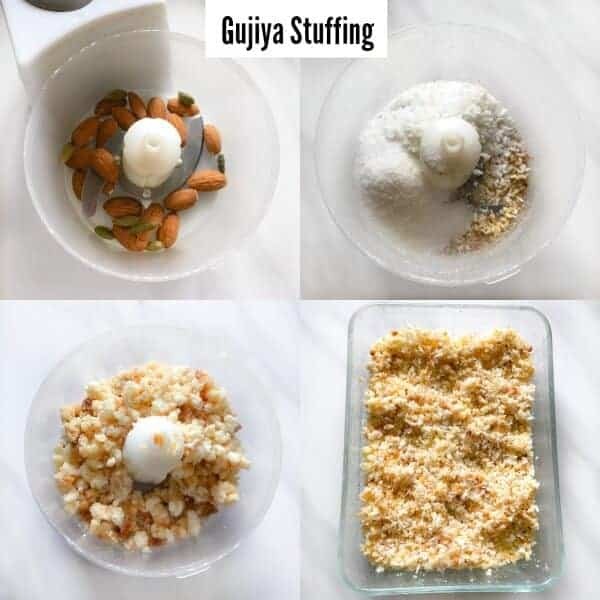 Once your khoya/mawa is ready, you just pulse dry fruits (almonds), green cardamom, coconut powder and khoya in a blender to crumble everything together. 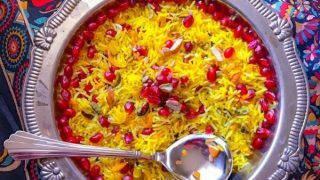 This mixture can be prepared and kept in the fridge for 2-3 days. This is the easiest step in the whole process. All you need is a round cutter or use a medium-size bowl with slightly sharp ends. Just roll the dough on a slab (slightly thick), then place the bowl upside down (shown in the pic above) and make circular shapes. Remove the shapes and mix the extra cuttings back into the main dough. Similarly, make all the circular shape and place them on a moist towel. If you want to further shorten this process, you can buy any of those gujiya shaped tools. You need to make a mix of flour+water to seal the ends of gujiya before you start stuffing them. Then take the disc to fill the stuffing and close the ends properly, seal the edges and crimp the edges using a fork. 1. Always fry the gujiya in low to medium flame for evenly fried version. 2. Don’t overcrowd the frying pan, I usually use a big pan and add only 3-4 gujiya at a time. 3. Don’t press the gujiya while frying or they’ll break and the filling will mix in the oil resulting in a splatter mess. 4. Always keep the fried gujiya on a kitchen towel for few seconds to soak up any excess oil and let gujiya firm up in the air. 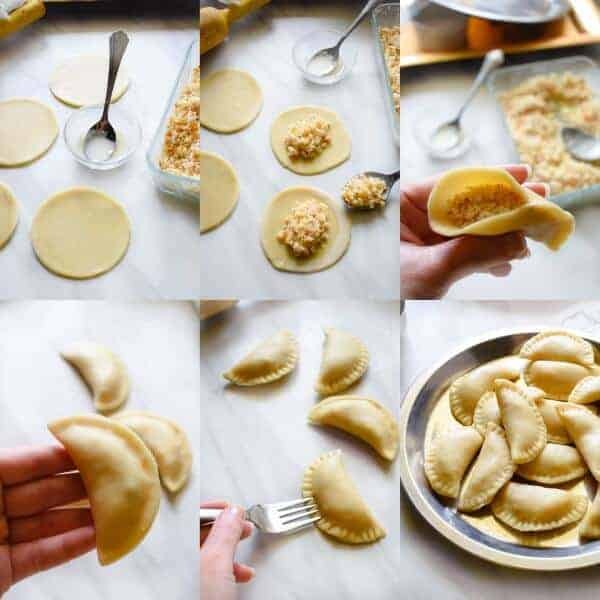 For this step, you just need to line the baking sheet with some parchment paper, brush the gujiya with a oil+flour mixture and bake for 15 minutes. 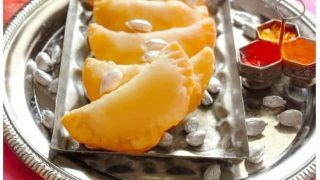 So, here are all the steps to make the Best Gujiya Recipe (Fried and Baked) for your loved ones. Enjoy the Festival of Colors with your friends/family and wish you lots of love. 1/4 Cup Olive Oil - for making dough. Place flour and oil in a food processor and blend for 30 second. Remove one tbsp of mix in hand and squeeze tightly to form a ball. If the ball is formed, the oil is enough (if not, add 2tbsp more oil and blend). Now, add water and slowly blend and form a stiff dough. Remove the dough and place on slab. Knead the dough for a minute and cover with a moist kitchen towel. 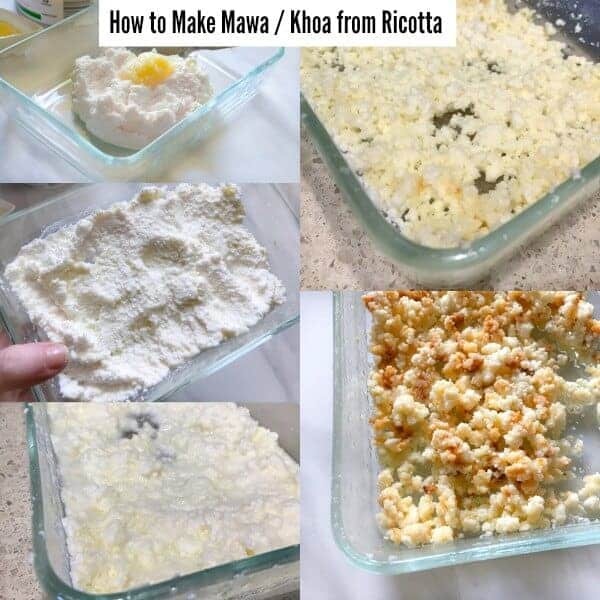 Mix ricotta and ghee in a bowl and microwave covered for 1:45 minutes. Remove and stir the mix. Place in microwave again for 2 minutes. Place in microwave for 1:20 minutes. 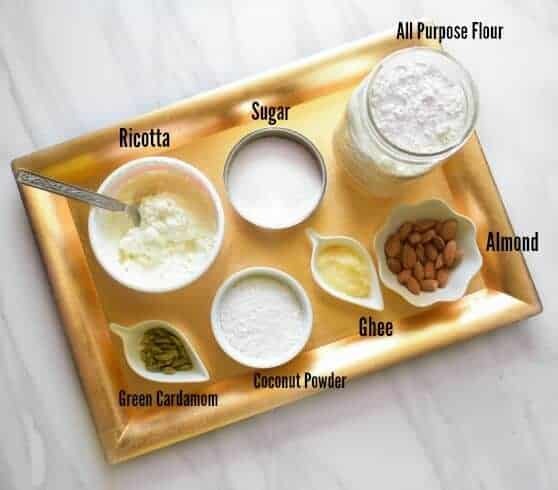 In a small blender, add almonds, green cardamom and coconut. Blend to form a coarse mixture. 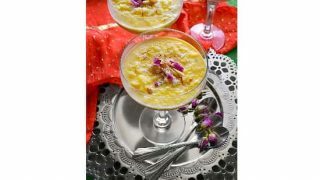 Add the cooled khoya and blend to form a thick mix. Take a large dough ball and roll it on a slab. (should be slightly thick). 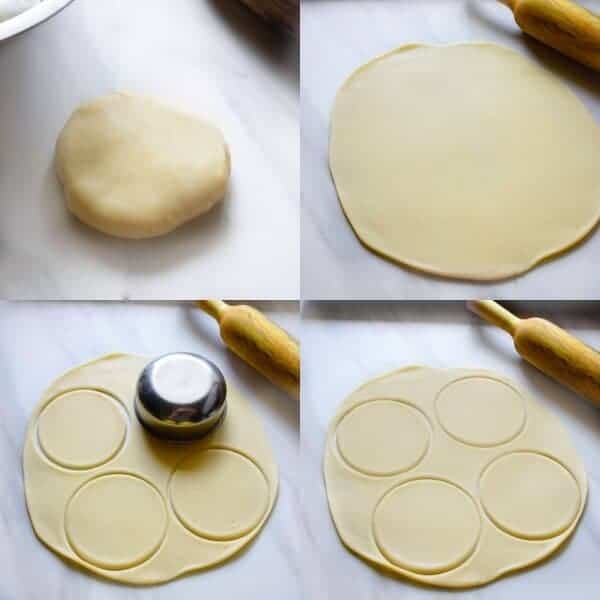 Now, take a bowl and press it facedown to form a circular shape on rolled dough. Similarly, make 3-4 circle as much the rolled dough permit. Remove any excess dough and keep the circlular disc on a plate. Similarly, roll and form disc using the entire dough. Now. 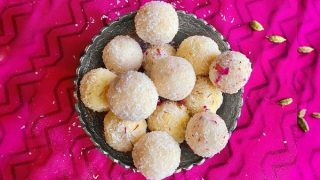 take one circular disc in your hand and place 2tsp filling in the center. Apply the water+flour mix to the semi-circle edges of one side of the disc. Press both the sides into each other and seal the edges. Place the gujiya on slab and press the edges using a fork (sealing the edges). Similarly, fill and seal all the gujiya. Heat 2 cups oil in a large deep pot. When the oil is hot (2 minutes), reduce the flames to low. Now, add 3-4 gujiya in the hot oil and fry over low-medium flames on both sides. Make sure each side is golden brown. Remove the fried gujiya on a paper towel to soak up excess oil. Place 7-8 gujiya on a large tray and brush with water+flour mix. Place the tray in oven to bake for 10-12 minutes. Remove the gujiya once golden brown and similarly bake all the gujiya. 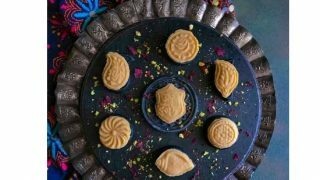 Once the gujiya are made, you can serve immediately. These store well in an air-tigh jar in fridge for a week. 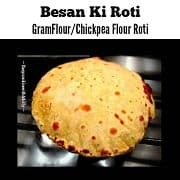 27 Replies to "Best Gujiya Recipe | Step by Step How to Make Gujiya (Fried+Baked)"
You mention 200F for the baked version. That sounds very low a setting (admitteedly I havent tried out the recipe yet, but in preparation to do so). Did you mean 200 Deg C by any chance ?